Jean-Antoine Watteau (October 10, 1684 – July 18, 1721) was a French painter best known for his invention of a new genre, the fête galante, a small easel painting of an idyllic scene with elegant people enjoying conversation or music in the beauty of the natural world. A Lady in a Garden Taking Coffee with Some Children adapts his typical parkland setting in a scene depicting ideal family life in a perfect setting. His most outstanding works include The Embarkation for Cythera (Louvre), Gilles (Louvre), Perspective (Museum of Fine Arts, Boston), Mezzetin (Metropolitan Museum of Art), and Gersaint's Shop Sign (Berlin). His paintings were influenced by the works of Correggio and Rubens. His work is also known for playing a part in the revitalized style first referred to as Baroque and later as Rococo. He is often credited with being the first major Rococo artist. 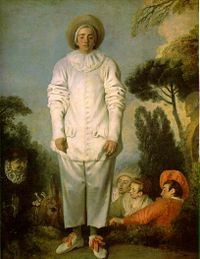 Watteau found inspiration for his paintings in the world of Italian comedy and ballet. He and his students are known to have greatly influenced the painters Jean-Honore Fragonard and Francois Boucher. His paintings also influenced fashion and garden design in the eighteenth century. Watteau was also a superb draftsman. Many of his drawings are known only from engravings. Not much is known about the birth and childhood of Jean-Antoine Watteau. It is known that he was born in the Flemish town of Valenciennes. Valenciennes was unique at the time because it had recently been annexed by the King of France, Louis XIV. The Watteau family was of Flemish descent. Watteau grew up in a home where his father, a master tiler, was often prone to drinking and brawling. At a very early age, Watteau showed an interest and a definite gift for painting. He began painting the local people of Valenciennes, including the shopkeepers, the traveling performers, and the various tradesmen. Watteau was soon apprenticed to Jacques-Albert Gérin, a local painter. However, Watteau's extraordinary talent soon surpassed that of his teacher and, like most young painters of his time, he made his way to Paris, in 1702. 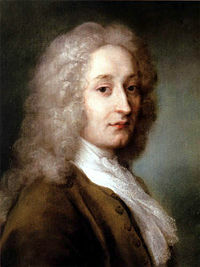 Once in Paris, Watteau found employment at a workshop on Pont Notre-Dame. He was commissioned to make copies of popular genre paintings in the Flemish and Dutch tradition. Although a repetitive job, the daily tasks served to help Watteau develop many aspects to his talent, including the development of his characteristic sketch-like technique. This second rate painting occupation was transformed when he met the painter Claude Gillot, designer of costumes and stage sets inspired by themes from the Italian commedia dell'arte, a troupe of traveling actors noted for satirical improvisation. Watteau met Gillot in 1703, and was hired as his assistant soon afterwards. Gillot was a pioneer of art, as well as a bit of rebel. Gillot openly went against the approved genre of official art commissioned under Louis XIV's reign. It was in Gillot's studio that Watteau was introduced to what would become a lifelong passion. The commedia dell'arte was a subject often painted by Gillot, even though its actors were expelled from France several years earlier. It was during this time that Watteau began painting this subject matter as well. Watteau soon moved to the workshop of Claude Audran III, an interior decorator. It was through acquaintance and admiration of Audran that Watteau began to pay particular attention to the elegance epitomized in his drawings. 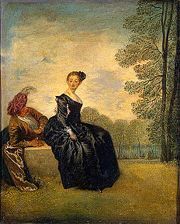 With Audran's help, Watteau was able to see the series of paintings of the life of Marie de Médicis by Peter Paul Rubens, that were housed in the Palais du Luxembourg. Audran served as curator of the Palais. Watteau was so impressed by the work of Rubens, and with various Venetian masters in general, that he spent endless hours studying them. These artists inspired him to implement even more elegance and movement into his creations. Watteau also found inspiration from the collection of his patron and friend, the banker Pierre Crozat, one of the foremost collectors of drawings in the eighteenth century. The Embarkation for Cythera (Louvre version): Many commentators note that it depicts a departure from the island of Cythera, the birthplace of Venus, thus symbolizing the brevity of love. While studying with Audran, Watteau made important contributions to the art world. He is so well known for creating the fêtes galantes that many have failed to realize Watteau's role in developing chinoiseries and singeries. These decorations were based on oriental subject matter and various monkey motifs. The design was then applied to various foundations, including panels, furniture and porcelain. In 1709, Watteau tried to obtain the highly sought after Prix de Rome. The Prix was an art scholarship to Italy. However, the Academy that decides the scholarship turned Watteau down. Not accepting failure as an option, Watteau applied himself to his craft even more and tried again for the prize in 1712. Watteau was surprised to find that the Academy now regarded his talent as being so great, that instead of offering him the Prix de Rome, they instead offered him a position as a full member of the Academy. To complete his membership, Watteau was required to create a reception piece. It took him five years to complete, but Pilgrimage to Cythera or the Embarkation for Cythera turned out to be one of his most famous masterpieces. These two versions of the same painting epitomize French Rococo at its peak. The elegant men and women are displayed in their shimmering silks. The painting is adorned with rose-cheeked cherubs. All these details are indicative of the style of this movement. It was with this painting that Watteau became known as the painter of the Fetes Galantes. As Watteau made a living as a painter, he found his eager buyers in the class of the bourgeois. These bankers and dealers were quick to admire the idealized aristocratic elegance of the Régence. There was an ever present irony in the paintings of Watteau; he painted the upper class, but sold these paintings to the middle class. He painted elegance and refinement, but lived most of his life under the oppressive reign of Louis XIV. Antoine Watteau possessed a certain spirit that was captured in his paintings. Although many artists tried to capture his talent in their own works, they generally fell short. Art critics have long proclaimed that Watteau, while painting depictions of frivolity and joviality, and the grand fêtes galantes he was known for, was actually painting on a deeper level than many gave him credit for. In Watteau's treatment of the landscape background and of the atmospheric surroundings of the figures can be found the germs of impressionism. All the later theories of light and its effect upon the objects in nature are foreshadowed by Watteau's fêtes champêtres. Among his most famous paintings, beside the two versions of the Pilgrimage to Cythera (one in the Louvre, the other in the Schloss Charlottenburg, Berlin), are Pierrot (long identified as Gilles), Fêtes venitiennes, Love in the Italian Theater, Love in the French Theater, Voulez-vous triompher des belles? and Mezzetin. The subject of his hallmark painting is Pierrot or Gilles, shown in a pathetic clown costume, with a fading smile. L'Enseigne de Gersaint (1720): In one of Watteau's last paintings, the portrait of Louis XIV and his own artworks are being packed away. Watteau's final masterpiece, the Shop-sign of Gersaint was effectively the final curtain of Watteau's theater. The apparent theme of the painting appears to be the promotion of art. This famous scene takes place in an art gallery where the façade has magically vanished. Watteau has taken the setting of the gallery and fused it with that of the street to create one contiguous drama. As Watteau grew in talent and age, many of his closest friends became alarmed as he adopted a careless attitude about securing a financially stable future. Many of them worried that Watteau, who suffered from several illnesses, was aware that his life might be brief. Contracting tuberculosis, Watteau decided to seek medical attention. In 1720, he traveled to London, to consult Dr. Richard Mead. Dr. Mead was a highly regarded physician. However, the damp and fog of England only caused his condition to worsen. Watteau decided to return to France and live out his last days there. Watteau died in 1721, at the age of 37. One of Watteau's dedicated patrons and friends was Jean de Jullienne (1686–1766), who wrote an early biography of the artist and sponsored an unprecedented campaign to record his drawings as etchings, contributing immeasurably to his fame and influence as a draftsman. Watteau's principal pupils, Jean-Baptiste Joseph Pater (1696-1736) and Nicolas Lancret (1690-1743), continued to paint fêtes galantes and personalities from the theatrical world. Following their paintings, two other artists (Boucher and Fragonard) tread a path laid by Watteau. But Watteau's art differed still from the whimsicality they painted. Watteau's influence on the arts (not only painting, but the decorative arts, costume, film, poetry, music) was more extensive than that of almost any other eighteenth century artist. The Watteau dress, a long, sack-like dress with loose pleats hanging from the shoulder at the back, similar to those worn by many of the women in his paintings, is named after him. Watteau's reputation declined with the rise of neoclassicism in French art, but after the French Revolution, and especially in the romantic period, it rose again. In 1984 Watteau societies were created in Paris and London. 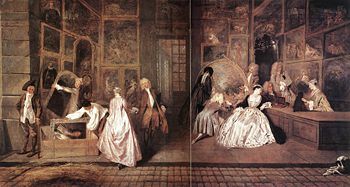 Das Ballvergnügen (Les Plaisirs du bal) (1717). Der Jäger des Nestes (1710). Die Familie des Mezzetin (1717). ↑ Artchive.com, Jean-Antoine Watteau. Retrieved November 27, 2007. ↑ Nndb.com, Antoine Watteau. Retrieved November 29, 2007. ↑ Met Museum, Jean Antoine Watteau (1684–1721). Retrieved November 29, 2007. The Age of Watteau, Chardin, and Fragonard: Masterpieces of French Genre Painting Nga.gov. The Roccoco and Watteau Nga.gov. Hughes, Robert. 1984. Sounding the Unplucked String Time.com.